Baseball – Last Tuesday, Eric Brunst threw his second shutout in league defeating #6 ranked Beckman 2-0. He had 7 strike outs and the team played errorless baseball. Maverick Freedlander and Andy Masotto had the winning rbi’s. Our Trojans beat first place Beckman 2 out of three games. On Friday , Junior outfielder Will Faure had 3 hits with 2 doubles in a 8-3 loss to Beckman. Junior Neil Boudreau and Freshmen Troy Lombardo pitched well for the Trojans. Our boys fell to CDM on Tuesday and look to bounce back as they once again play CDM Friday afternoon. Good luck baseball. Boys Golf – Our golfers had a big victory last Thursday versus CDM at Newport Beach Country Club. The team shot a 3-under par 172 and beat CDM at their course. In addition, Ari Gulugian shot a school record 30 (5-under par). On Monday this week, we clinched a CIF berth by beating Irvine at Strawberry Farms with an even par score of 180. Once again the low score came from Ari Gulugian with a 33 (2-under par). Tuesday we lost to Northwood in a really tight match: 175-174. Both schools played really well. The UNI players had the following scores on the par 35 Oak Creek Golf Club: William Tse matched Ari’s record 30, Ari shot a 32, and Griffin Pace (freshman) shot even par 35. The scores were unbelievable for both teams. League finals are next week. Great job golfers. Keep hitting the ball straight. Boys Lacrosse – The UNI boys lacrosse team played their best game of the year at Sage Hill, but fell 11-10 in the final minute. It was a back and forth game with many lead changes. UNI had 8 different scorers and displayed their best team play to keep the game very dramatic going into the last quarter. This type of team play will serve them well in the seasons to come. Our boys final game is this afternoon v Irvine. Good Luck LAX! Girls Lacrosse – Girls Lacrosse played two tough league matches losing to Beckman and Corona del Mar. However, for the first time ever, the Lady Trojans outplayed Corona del Mar for the second half of the game, outscoring them 6-4. It was not enough to gain the win, but it was a very strong showing for the lacrosse team. More positively, the girls secured a league win against Northwood on Monday, 10-5. Kathy Guo continued to add to her impressive offensive stats scoring 4 goals. Anneke Gustafson, Honia Mohtashami, Clarissa Wu, Amanda Shubin, Danielle Ochoa, and Sarah Verdegan all added to the tally, highlighting the potent offense of the team. Lily Huang (goalie) had 9 saves and the defense did a masterful job of preventing shots from occurring in the first place. The team wraps up the season this week with an away match against Irvine and a final home match against non-league opponent Sage Hill on Friday, May 1st. It is the Senior game, so come out at support our girls. Softball – Our girls suffered a tough loss to Irvine on Tuesday, but both Aubrey Maher and Michela Boarnet went 2-2. Both freshmen pitchers, Janette Oh and Zoe Manjarrez, saw time on the mound and Michela Boarnet has been solid behind the plate. The girls start the second round of league Thursday against Woodbridge at home. Our last league game is next Thurs against CDM and is also our GOW! Come out and support our softball players! Boys Swim – Trojan boys had another fantastic showing this past week. Last Wednesday, the boys won the G.O.W. against Number 3 ranked Northwood with an impressive 119-51 victory. This week the boys capped off their dual meet season by beating Irvine 135-35. Trojan boys head into league finals next week with a 5-0 record in league and look to win their fourth league championship in a row. This past Thursday (prelims) and Saturday(finals), the Trojan boys competed in the 43rd Annual Foothill Swim Games. 7 of the 13 teams competing in this invitational are ranked in the Top 10 in Orange County. The boys were on a mission to get their best times of the season at this very fast swim meet. 19 CIF cards signed and 4 meet records later, the boys triumphed by a whopping 300 points over the 2nd place team. University led the PCL sweep with 555 points, Beckman with 255 and Northwood with 253. Daniel Tran, Matt Yong, Andrew Knoell, and Will Hofstadter started off the meet by capturing a first place finish in the 200 medley relay. Alejandro Ortiz got 2nd in the 200 free in a season best and CIF auto qualifying time. Four boys qualified for the championship final in the 200IM. Daniel Tran, Ken Takahashi went 2nd and 3rd and Stephen Yang and Matt Yong went 7th and 8th for the impressive showing in the event. Will Hofstadter got first place in the 50 free and captured a meet record in the 100 free in a blistering 45.71. In the 100 yard Butterfly, Andrew Knoell got first place, Stephen Yang 2nd and Chris Havton got 3rd. That is right…1-2-3 for UNI! Ken Takahashi got 2nd and George Horvath got 4th in the 500 Free. The 200 Free Relay of Ortiz, Takahashi, Wong and Hofstadter tied Santa Margarita for first place and a share of the meet record. In the 100 backstroke, Daniel Tran set the meet record with a 49.99, beating his record from last year. Andrew Knoell got 3rd with CIF auto cut and Jarod Yoshihara got 4th .03 off the auto time. In the 100 Breaststroke, Matt Wong got 4th place with a CIF auto cut. In the last race of the meet, the 400 free relay of Ortiz, Takahashi, Knoell and Tran set a new meet record of 3:07.30. That is the second fastest time in school history and less than a second off the school record. GO TROJANS!!! Below is a picture of our boys with their championship plaque from the Foothill Games! Girls Swim –After edging out Northwood last week by a score of 86-84, the UNI Varsity girls put up some fast times but ended up falling to Irvine High yesterday by a score of 103 to 67 in the last dual meet of the season. Outstanding performances of the meet included senior Lauren Weins lowering her CIF automatic qualifying time in the 100 back as well as her CIF consideration time in the 100 fly. Joyce Yang made CIF consideration cuts in both the 200 IM and the 100 breastsroke. Elysia Ouyang also dropped time to make a CIF consideration time in the breaststroke. The 200 Medley Relay team of Weins, Yang, Kathy Lim and Princess Ferguson-Nguyen dropped their CIF consideration time lower, and Kamila Szabdos and Sonia Bajak both dropped time in the 500 freestyle. The girls will be swimming in the preliminaries of the Pacific Coast League meet next Tuesday , with the top 16 in each event moving on to Finals on Friday. The PCL meet will be held at the Wollette Aquatics Center next to Irvine HS. Come on out and support the swimmers! Boys Tennis – The UNI boys tennis team moved to 13 and 2 overall, 8 and 0 in the PCL with a 14 to 4 win over CDM on Tuesday. Josh Piatos and Hans Hwang swept all three sets at 3rd doubles for the Trojans. Rohan Lageweg also won all three of his sets. Last weekend three members of the UNI team took part in the annual Ojai Valley Tennis tournament. Riku Hashiyada represented UNI playing singles and lost in the 2nd round. Konrad Kozlowski and Ardi Safi played doubles and had a great tournament losing in the semi-final match. Congratulations to all three boys for a great weekend. The Trojans will take on league foe Northwood on Thursday at Northwood. With a win our boys will secure the League Championship! Good Luck Tennis! Boys Track – Boys Track went up against Northwood High School last week and there were some great performances. The highlights were Tanner Schiedow in the 1600, Zane law in the 800, Cody Epstien in the 40, Aidan Galasetti in the 300 Hurdles, Justin Seo in the 100 and 200, Eric Kawana along with Alex Hurwitz in the 3200, Austin Kim in the Shot Put, and finally Vedavit Shetty and Julian Ricci in the Triple Jump and Vedavit Shetty in the Long Jump. This last Saturday, Aidian and Zane participated in the Orange County Track Championships. Aidian finished 20th overall in the county for the 110 High Hurdles while Zane finished 30th overall in the 800 for the county. Girls Track – The girls track team had an amazing performance against Irvine High yesterday. The girls varsity team dominated with a final score of 83 to 43. We had outstanding first place finishes by Paige Metayer (400, 800, 300H), Mia Maher (100) and Caroline Werth (200, triple jump). Also, Janine Bryant and Cheryl McElwee took 1st and 2nd in the 3200. We are very proud of our athletes and are looking forward to watching them succeed at league prelims Tuesday here at UNI. Boys Volleyball – Our boys volleyball team is at Northwood tomorrow @ 5:15. Good Luck Boys! DODGEBALL – The UNI Dodgeball tournament is in full swing. We are down to the final 4 teams. The semi finals will take place next Tuesday and the finals will take place next Friday. The winning student team will then get to play a team of staff members. The kids are having a great time with this tournament and the gym has been packed with students every day. The Trojan Army is know for being the best student section in our league and the surrounding area. We are the original spirit club in the the league and the other schools are constantly trying to copy things we do. It is our goal to be the first to do creative things to help publize our student athletes. The Trojan Army has spent thounds of dollars helping to publicize our athletic programs. Some of the recent purchases by the Trojan Army include the large run through banner that the football players use, the large 20×30 foot U banner that the students wave above their heads at the games, The 3 large flags and the air siren that are used each time we score, the Us painted on the ramp down to the stadium, the U logo stickers that are throughout campus and the locker rooms, and the vinyl Trojan Army banners that are used at UNI games. We are once again setting our sights high and looking to purchase a run through tunnel that will grab everyons attention. An example of the tunnel is below. We would once again be the first school in the league and area to have such a tunnel. The Trojan Army has already raised a substantial amount of money for this project. We are close to being able to order this run through tunnel. Our plan is to use this tunnel at football games, pack the gym night, pep assemblies, Senior day games, and at any CIF Championsip walk. As of right now we are about $1000 dollars away from being able to purchase this tunnel. If you would like to make a donation to help offset the cost of this tunnel please send a check with your student to the Athletic office. 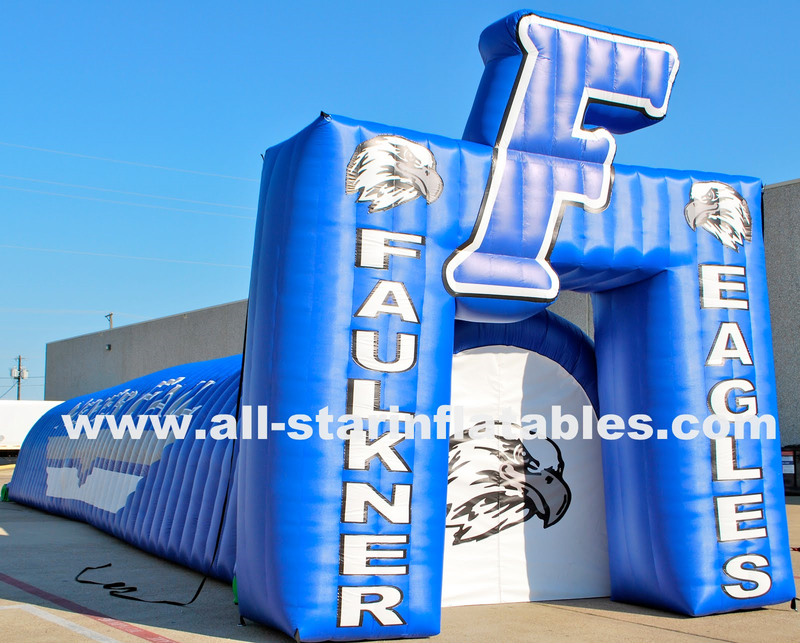 If each athletic family gave $20 we would be able to order this tunnel right away. Donations can be turned into the athletic office or given to Coach McCaffrey. Checks shold be made out to UHS. Thank you UHS community for your support. This run through tunnel will once again give us the AHH factor that we have when we play other schools. Thanks for your support and as always GO TROJANS! Boys Golf – Our boys beat Northwood Thursday, April 2 before spring break and Irvine Tuesday. We are currently 10-2 overall and 4-2 in league. Junior Ryan Kurniawan stepped up for us in both matches. He held the tiebreaker score to help us beat Northwood and was the low round against Irvine with a 35 (1-under par). We have a big match today versus Woodbridge at Rancho San Joaquin. Our boys are currently ranked #9 in Orange County. Good Luck today Golfers! Boys Lacrosse – The boys lacrosse team traveled Monday night after spring break for a night game versus Irvine HS. The Irvine HS team is heavily steeped in seniors and it showed. Uni played well and with great intensity, but fell to the Vaqueros 15-4. The game scores and the teams record do not do the program justice as the players continue to improve greatly. The team is playing well and their team chemistry is improving with every contest. Girls Lacrosse – The Girls Lacrosse team made history this week earning a league victory by the largest margin in team history defeating Irvine 17-5. Kathy Guo led the offense by scoring 4 goals (adding to her league total of 52 goals! ), but nine total players added to the scoreboard. Senior Alisa Saleh netted two goals and Sophomore Amanda Shubin added two more, including scooping up a rebound off the post right in front of the goal and launching a shot past Irvine’s goalie. On Wednesday, the Lady Trojans fell to Woodbridge, 24-13. Although it was a loss, the girls played phenomenally well, and were led in the offense by Sarah Verdegan, who scored 6 goals in total (against her former team, no less)! Senior Clarissa Wu added two impressive goals in the match and Junior goalie Lily Huang kept the game interesting by making 10 saves! The team is back in action today in a non-league match against Tustin, and then back in league action next week. Softball –The Lady Trojans opened up league play at Woodbridge Tuesday evening. After jumping out to a 3-0 lead in the first inning, the girls fell to Woodbridge 12-3. Hits in the first inning from Janette Oh, Zoe Manjarrez, Anna Hawkins and Michela Boarnet let to those three runs. Janette Oh held them in the circle until the 3rd inning when the Woodbridge bats livened up. Kiana Boman covered a lot of ground in the outfield showing great hustle and focus. Today the girls take on Beckman at home at 3:30. Good luck girls! 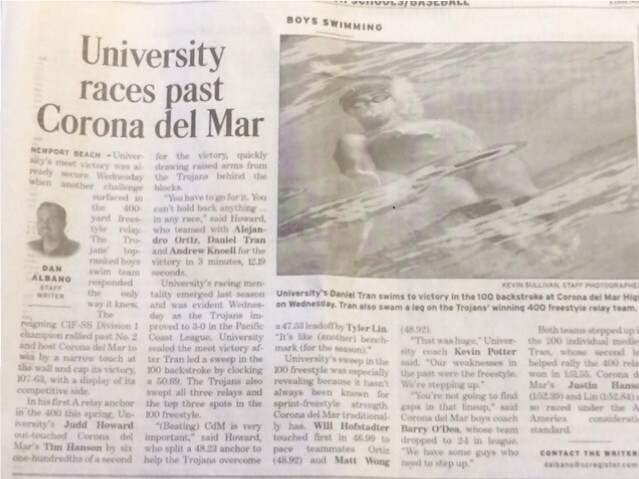 Boys Swim – Our top ranked Boys swim team faced off against the No.2 ranked in Orange County and league rival, CDM. The boys won in a dominating performance 107-63. All three relays got first place and the boys won 5 out of 8 individual races. The meet got off to a great start with a big win in the 200 medley relay. Daniel Tran, Judd Howard, Andrew Knoell, and Will Hofstadter were right on their season best time in that event. Alejandro Ortiz won the 200 Freestyle. Daniel racked up a pair of first places in the 200IM and 100 Backstroke. Will Hofstadter remains undefeated in the 50 and 100 Freestyle. The 200 Free relay got first with Ortiz leading off, Matt Wong, Jarod Yoshihara, and Will Hofstadter with the strong anchor leg to seal the victory. The most exciting race came at the end of the meet in the 400 Free relay. It was a close race the entire 3 minutes and 12 seconds. Ortiz, Tran, Knoell, and Howard out-touched CDM by .06 for the big win. Our boys are 3-0 in league and face off against No. 3 ranked in Orange County, Northwood for the G.O.W. GO TROJANS!!! Below is an article from the OC Register on our big win. Girls Swim – After winning their meet against Beckman right before Spring Break, the Uni Varsity girls were back in the water at CDM yesterday. The teams were separated by only 4 points at the break before CDM pulled away in the second half to win 95 to 75. The Uni girls JV and open divisions both won their portions of the meet. The 200 Medley relay team of Lauren Weins, Joyce Yang, Kathy Lim and Princess Ferguson -Nguyen lowered their CIF consideration time by 2 seconds to a 1:55.57. In the 100 backstroke, all the Uni Varsity girls swam season best times. Senior Lauren Weins made the CIF Automatic cut with a 58.13, sophomore Anne Jang lowered her season best CIF consideration time to 1:01.39, freshman Alondra Ortiz made her first CIF consideration cut with a 1:03.00, and senior Julia Knoell dropped her time a full second from her season best. The 400 freestyle relay team of Anne Jang, Kathy Lim, Claire Jang and Princess Ferguson-Nguyen won the last event of the day with a CIF consideration time of 3:50.15 lowering the teams previous best by almost 8 seconds. Great job girls! Uni Swim will be back in the pool next week for the last home meet, which is the GOW, against cross- town rival Northwood on Wednesday, April 22, then head to Foothill HS on Thursday for the prelims of the Foothill Games Invitational. Good luck Girls! Boys Tennis – The UNI boys won their 7th straight match defeating league opponent Irvine, 15 to 3. Freshmen Patryk Kozlowski swept at singles to lead the Trojans. UNI moves to 9 wins and 2 losses overall and 5 and 0 in the PCL. The boys will take on Woodbridge at home this afternoon. Good Luck Tennis! Boys Track – Boys Varsity Track lost to Beckman before spring break. Uni had some outstanding performances by Eric Kawana in the 3200, Tanner Schiedow in the 1600, Zane Law in the 800, Vedavit Shetty and Julian Ricci in the Tripple Jump and Long Jump, Aidan Galasetti in the 110 High Hurdles, Zane Law in the 300 Hurdles, Hamza Diab in the shot Put, and Malhabour in the 100 and 200. This week we are up against CDM at CDM. Go Trojan Track and Field! Girls Track – On Thursday April 4th we faced Beckman in a home meet. The Varsity girls were successful in taking down Beckman. The varsity girls finished with a final score of 81-47. We had outstanding first place performances by Lydia Haug in shot put, Melissa lee in discus and Daria Shkel in high jump. Paige Metayer also had several first place finishes (and personal records) in the 400, 800, and 300 meter hurdles. Sofya Ogunseitan had a time of 27:31 in the 200 meter, also earning a first place finish. This afternoon we take on CDM at CDM. Good Luck Track Stars. Boys Volleyball – GOW FRIDAY @ 5:15 – Boys Volleyball beat Northwood this Tuesday in a tight exciting game, winning 16-14 in the 5th set. Shout out to Zain Qureshi on a clutch save in the last set of the match, unbelievable setting by Matin Bikdeli as always and Nathan Mai, Ray Gong and Junayed Naushad for leading the front row and ultimately to the win. Come out to the gym tomorrow night for our volleyball GOW. Game time is 5:15. Good Luck Boys! GIRLS BASKETBALL ALL STAR GAME – This Saturday at 5pm, Kiara Warren will represent our school and our league in the 50th annual North-South Girls Basketball All – Star Game. The game will be at Concordia University and students are free. Congratulations on being selected for the game Kiara and Good Luck. DODGEBALL – The UNI Dodgeball tournament is almost here. The last day to sign up for the tournament is tomorrow. The bracket will be posted on the gym doors on Monday and Games will begin on Tuesday April 21st. last year we had 42 teams sign up. Make sure you turn in your team roster and $35 to the SAC by tomorrow if you are interested in playing. Team uniforms are strongly encouraged. Be creative and appropriate. The top two team uniforms will win a free pizza party for their team. Council Elections – We will be conducting our class council elections on Friday. If you are a current Freshman, Sophomore, or Junior please vote for the students who you think will do the best job for your class. There will be no Trojan Thursday next week as we are off on Spring Break. We will return on the 16th. Baseball – Our boys fell to CDM last Friday and to Northwood this Tuesday. The baseball boys will be home this afternoon to wrap up the first round of league play v Irvine. First pitch is @ 3:30. Good Luck Baseball. Boys Golf – We had an exciting week last week beating top teams in the county. After beating Woodbridge on Tuesday, March 24, we beat Beckman (ranked 5 at the time) Thursday 183-186. Koichiro Sato shot a 3-under par while Ari Gulugian and William Tse both shot a 1-over par. This put us into the top ten at number 9 in the county. On Tuesday the team struggled and lost to Corona del Mar…197-188 on our home course, Strawberry Farms. The league is tough. The PCL has had 5 of the 6 teams ranked in the county at different times this year. Our boys are now 8-2 overall and 2-2 in the PCL. Great job golfers and good luck this afternoon v Northwood! Boys Lacrosse – Our Boys Lacrosse team had another tough match-up against Northwood on Wednesday and ended up dropping the match 11-3, but showed some resiliency and great defense in a game that could have been much worse. Amir Javadi, once again, showed that he can defend even the best shooters in our league and shut down their best scorer for the entire second half. Baeksun Kim had all three goals for the Trojans. The team is improving and looks forward to its next game Monday, 4/13, 6:00 at Irvine HS. Girls Lacrosse – The Lady Trojans lacrosse team was up and down this past week. After struggling in a loss against Corona del Mar (17-5), the girls rebounded with a league win against Northwood 10-8. The team wants to thank all of the fans that came out to support them in their victory, which was also the Game of the Week. Kathy Guo continues to be lethal in offense, and Sarah Verdegan, Nika Zarazvand, Andrea Echeverry, and Clarissa Wu also netted beautiful goals yesterday. The potent offense would have been for naught, though, without the outstanding work of the defense and an incredible match by goalie, Lily Huang. Lily earned a total of 15 saves, including 9 in the second half, to secure the victory for the ladies. The ladies are back in action Monday, April 13th, in a home match against Irvine. Come out and support! Softball – Last Thursday the girls battled an exciting back and forth game at Estancia. The final score came down to a 14-12 win for Uni. Freshman Janette Oh collected the win in the circle pitching all seven innings with Michela Boarnet behind the plate. Janette went 3-5 with an RBI and two stolen bases. Senior Mia Maher went a perfect 5-5 with three RBI’s, three stolen bases and three runs scored. Seven different Trojans tallied hits for a total of 11 hits in the game. Freshman Zoe Manjarrez continues to impress at the plate with a triple, two walks, 2 RBI’s and two runs scored. Overall it was a great team effort that everyone contributed to. The Trojans open up league Tuesday after Spring Break against Woodbridge 5pm at Barber Park. 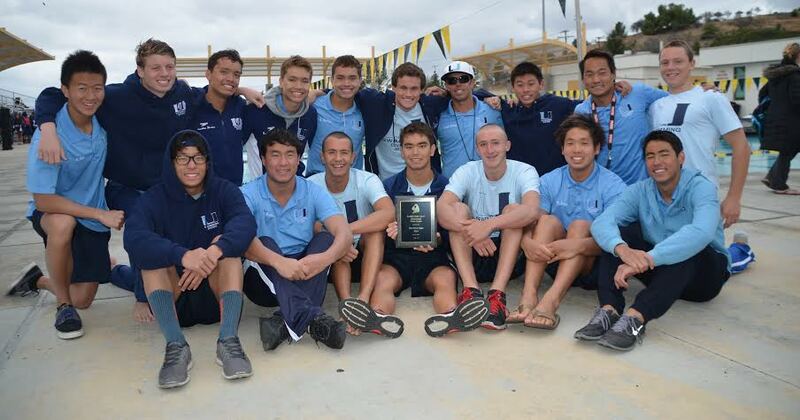 Boys Swim – It was a great week for the Number 1 team in OC Trojan boys swim and dive program. On Saturday, Freshmen Jonathan Aisik competed in the Mission Viejo dive meet. In only his second dive competition ever in his life, he successfully completed all 11 dives to achieve the CIF consideration cut. Jonny is not too far off from getting his auto cut. Go Jonny Go!!! On Monday, the boys had a non-league away meet against No.9 Tesoro. Trojan boys claimed first place in 10 of the 11 events and won the meet 121-49. Ken Takahashi got first in both of his races getting CIF Auto Cuts in the 200IM and 500 Freestyle. Daniel Tran, Alejandro Ortiz, George Horvath, and Jon Havton went 1-2-3-4 in the 200 Freestyle. Will Hofstadter got CIF Auto cuts in both the 50 Freestyle and 100 Breast. Judd Howard got first in the 100 Breast in a CIF Auto 58.64. All three relays got first place. The boys were back at it again on Wednesday hosting Beckman in a league meet. The boys won 123-47. Alejandro Ortiz won the 200 free in a season best 1:41.97. Daniel Tran continued to be on fire and posted CIF Auto times in the 200IM (1:51.24) and 500 Freestyle(4:31.28). Will Hofstadter went a blazing 46.64(CIF Auto) in the 100 Freestyle for first place. Sophomore Andrew Knoell got first in the 100 Butterfly. Junior Jarod Yoshihara got first in the 100 and dropped 2 seconds off his season best time! Way to go Jarod! Matt Wong won the 100 Breast in 59.73. Matt Wong, Matt Yong and Chris Havton went 1-2-3 in the 100 Breast. GO TROJANS!!! Girls Swim – Our girls won yesterday v Beckman. Anne Jang got her consideration cut in the 100 backstroke. Our girls are back in action April 15th at CDM. Boys Tennis – Our boys tennis team continues to play well as they racked up two wins over the past week. Last Thursday our boys beat Beckman by a final of 15-3. Konrad Kozlowski swept all three of his matches in singles play. Our doubles teams also played extremely well in this match. On Tuesday our boys beat CDM 17-1. The OC register covered our match and the article is below. The article heading sums up our boys play. “University shows Corona Del Mar it’s still the team to beat in PCL” Konrad Kozlowski and Rohan Lageweg swept in doubles while Riku Hashiyada and Ardi Safi also swept in singles. This win marks the 81st straight PCL victory for our tennis program. Their last league loss was in 2006. Our boys are back on the courts this afternoon here at UNI v Northwood. Boys Track – GOW Today 3:00 – Boys Track lost a tough meet against Woodbridge last Thursday but still had some outstanding performances. Zane Law took 3rd in the 800 and 300 Hurdles, Aidan Galasetti took 2nd in the 110 High Hurdles, Cody Epstien was 2nd and Dylon Hong was 3rd in the 400, Lorenzo Malhabour was 2nd and Moo Jin Kim was 3rd in the 200, Justin Seo was 2nd and Lorenzo Malhabour was 3rd in the 100, and for Hamza Diab he won the shot put. The Team also competed at The Beach Cities Invitational. We had some great accomplishments with the most notable coming from Zane Law in the 800 with a season best of 2:02 and A 6TH place finish overall. This afternoon our track team will compete in their GOW. Come out to the stadium and cheer everyone on. Go Trojan Track and Field. Girls Track – GOW TODAY 3:00 – Last week we faced a strong opponent in Woodbridge. Despite falling our Varsity put out a strong performance with a final score of 55-68. We had impressive 1st place wins in the 100 m hurdles (Sonia Lin), discus (Melissa Lee), shot put (Lydia Haug), and triple and long jump (Caroline Werth). Our freshman Paige Metayer took 1st place in 3 events (400 m, 800 m and 300 hurdles), moving into the UNI Varsity Top 10 of all time in all 3 events. Last Saturday, senior Caroline Werth competed at the Beach Cities Invitational, earning an 8th place finish in triple jump with a distance of 34’-06.50”. She also earned a 3rd place finish in the long jump with a distance of 17’-03.00”. This afternoon our track stars will compete against Beckman in their GOW. Come out to the stadium and cheer everyone on. Boys Volleyball – Boys Volleyball came together as a team Tuesday against Beckman. Even though they lost, the match was one of the most exciting games Uni Boys Volleyball has put together in the last 3 or 4 years! To all Uni students, come out and support your fellow Trojans after you get back from Spring Break. Our next home games are the Tuesday and Friday after you get back… Our boys will entertain you from start to finish. Tacos and Co supporting athletics department – Tacos and Co will be on campus this afternoon to sell their food and drinks. We have our track Game of the Week this afternoon and we also have tennis and baseball games going on as well. It will be a big day here at UNI. Tacos and Co will be set up on the blacktop and they will be donating a portion of their profits back to the athletic department so bring a few bucks and come hungry and check out our athletic teams this afternoon. Track v Beckman – 3:00 – This is their GOW come out to the stadium and support our track stars.